Smaller than the Brainerd Hospital, the companion hospital in Missoula is a remarkably integrated and well-detailed example of the Shingle style. It provides the most direct link between the work of McKim, Mead & White and Gilbert's early independent work in St. Paul. Shingle-style features include the general massing, large encompassing porches, corner bay windows, and cupolas. Details of the porch and chimneys are derived from American Colonial architecture. A substantial Shingle-style addition later replaced the west wing of the building. There are similarities in massing between this building and the Riggs House (1885), the Watson House (1885), and the Squires House (1889). The Colonial-style porch and the Shingle-style dormer relate to several other projects. This eastern building set in western surroundings points to the sharp contrast between the physical and spiritual differences of the regions as well as the rapid westward movement of eastern architecture. 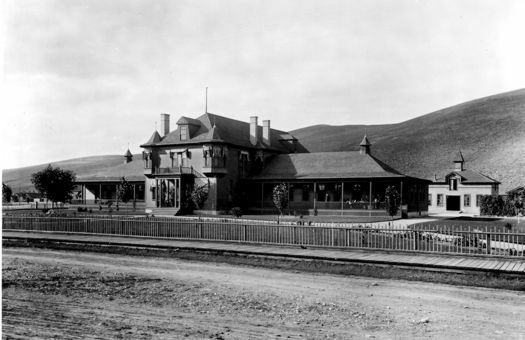 An 1885 article published in Northwest Magazine states that the Missoula Hospital was built at the same time as the Brainerd Hospital and credits the project to Gilbert and McKim, Mead & White. Northwest Magazine is a reliable source for this information as it started in 1882 as an organ of the Northern Pacific Railroad. It was first published in New York, but E. V. Smalley, its publisher, moved the magazine and himself to St. Paul in the 1880s, locating opposite the Gilbert Estate on Third and Robert Streets. The building has been razed.